Born: 1801 in Sandwich Ma. 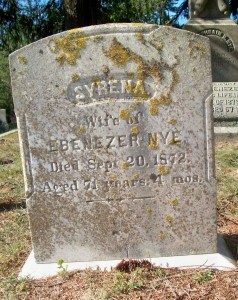 Died: September 20, 1872 in Sandwich Ma. at 71 yrs, 4 mos. 1. Angeline Nye Keith; (December 19, 1818 – December 28, 1904); Married Frederic Keith (1821 – 1866) in int. April 17, 1841; Angeline, Frederic & four of their children are buried together in Cataumet Cemetery. 2. 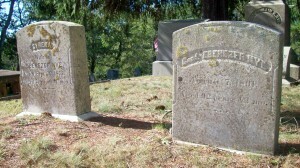 Ebenezer Franklin Nye, Capt. ; (October 13, 1822 – 1879); Married Joanna E. Godfrey (1826 – 1908) (Christopher Godfrey, Capt. & Mary Ann Barlow) in Sandwich Ma. on August 6, 1849; Ebenezer F. “Who lost his life in the Arctic; Winter of 1879-80; Aged 57 yrs”; His headstone is in Cataumet Cemetery; Joanna died in New Bedford Ma. at 81 yrs. & is buried in Rural Cemetery in New Bedford Ma..
3. William Foster Nye, Civil War; (May 20, 1824 – August 12, 1910); Married Mary S. Keith (1824 – ?) (Aberdeen Keith & Deborah Briggs) in New Bedford Ma. on May 20, 1851; William was a very successful oil merchant in New Bedford Ma..
4. Ephraim B. Nye, Lt., Civil War; (May 1, 1826 – March 25, 1865); Married Elizabeth Brown Howard (1824 – 1914) (Calvin Howard & Hannah Handy) in Sandwich Ma. on May 30, 1848; Ephraim is buried in Cataumet Cemetery. 5. Albert Gallatin Nye; (December 25, 1828 – June 22, 1922); Married (1) Susan L. Chadwick (1831 – 1854) (Micajah Chadwick & Jane G. Fisher) in int. December 30, 1852 & married (2) Phoebe Ann Clark (1832 – 1894) (Alexander Clark & Mary Hussey) in Falmouth Ma. on June 24, 1856 & married (3) Eliza E. (Swift) Ellis (1834 – ?) (Thomas Swift, Jr. & Temperance Crowell) in Bourne Ma. on January 27, 1895; Eliza married (1) Clark S. Ellis (1820 – 1891) (Thomas Ellis & Rebecca Burgess) in Sandwich Ma. on March 5, 1857; Albert was a machinist & had a business in San Francisco Ca. ; Phoebe died in Oakland Ca. ; Albert & Phoebe are buried in Cataumet Cemetery. 6. 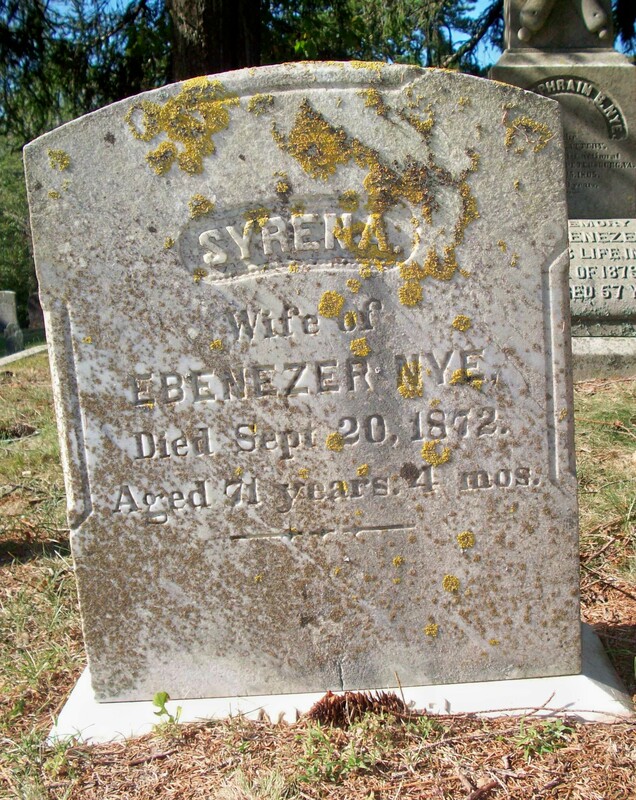 Syrena M. Nye Barlow; (October 29, 1830 – ? ); Married Charles Bennett Barlow (1830 – 1912) (Levi Limcoln Barlow & Sally Lumbert) in Sandwich Ma. on August 14, 1851; They lived in California. 7. Mercy D. Nye Brown; (July 13, 1832 – 1919); Married William Wallace Brown (1828 – 1904) on Abt.1874; They lived in California; Mercy & William are buried in Cataumet Cemetery. 8. David Dimmick Nye; (November 29, 1833 – September 28, 1910); Married (1) Hannah Townsend Curtis (1832 – 1888) (Josiah Curtis & Sophia Nye (Swift)) in Sandwich Ma. on July 30, 1862 & married (2) Esther F. (Eaton) Dennis (1843 – 1922) (Frederick Eaton & Catherine Kern) in Bourne Ma. on October 4, 1888; Esther married (1) George H. Dennis (1843 – 1883) (William Dennis & Mary Crygier) in Sandwich Ma. on June 21, 1863; David, Hannah & Esther are buried in Cataumet Cemetery.